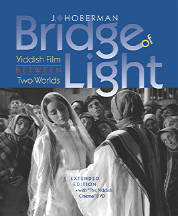 Originally published to coincide with the groundbreaking retrospective of Yiddish Cinema at the Museum of Modern Art in 1991. Drawn from the Yiddish films in the collection of The National Center for Jewish Film, the exhibition was co curated by Adrienne Mancia of MOMA, J. Hoberman, and Sharon Pucker Rivo NCJF Executive Director & Co-Founder. J. HOBERMAN is senior film critic at The Village Voice. He is the author of numerous books including An Army of Phantoms: American Movies and the Making of the Cold War; Midnight Movies; 42nd Street (BFI Film Classics); The Dream Life: Movies, Media, And The Mythology Of The Sixties; On Jack Smith's "Flaming Creatures" (and other Secret-Flix of Cinemaroc); The Magic Hour: Film at Fin De Siecle; Vulgar Modernism: Writing on Movies and Other Media; Dennis Hopper: From Method to Madness; The Red Atlantis: Communist Culture in the Absence of Communisml and Entertaining America: Jews, Movies and Broadcasting (with Jeffrey Shandler). Hoberman has taught cinema history at Cooper Union since 1990.